Folks, I make it a habit to respond to as many fans as I can, because I wouldn’t be where I am today without their money. Sometimes, fans leave their responses to one of my books on the Amazon.com, and I do my best to let them know they’re heard and they appreciate the feedback, even if what I had to say didn’t appeal to them in that particular moment. I actually find it distasteful when an author replies to a reader’s review. It always sounds so petty and defensive. Frankly, when someone publishes ANYTHING, they are bound to find detractors who don’t like what they read. But, to reply to them in the review always seems so unprofessional and juvenile. Kind of pathetic, actually. I don’t see that kind of behavior from REAL authors who make it BIG. Can you imagine if every time a critic wrote a review of a movie or a book, that the author or producer or the actors REPLIED to the reviewer! Oh my, that would be a sight, wouldn’t it? I guess there is a reason we DON’T see that… must be professional protocol. Must be behavior that is not considered appropriate by the particular industry. I hope the author doesn’t embarrass himself by replying to my comment. That would be very, very, very juvenile. (Just my opinion, of course). Having spent years aimin’ to be unprofessional (since professional people seem a tad stodgy), it sounds like I’m on the right track. I hadn’t considered it sounding petty and defensive, though, as I’m not sure what there would be to defend, so it’s interesting that you’ve had that reaction. As to why authors don’t respond more often to reviews, that’s a good question. I think you raise a great point, that far too often people are afraid of acting because of fears of what’s appropriate, or professional, or how they’ll be judged by people around them or in the industry they’re in. If they’re not ready to face that fear, it can be pretty uncomfortable to see someone who speaks their mind regardless of the outcome. If everyone was willing to just stop all those silly fears and communicate without them, that would be a sight indeed! Thanks for your perspective! And don’t worry, responding didn’t embarrass me at all. 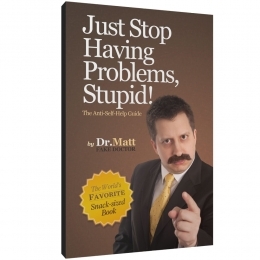 Go read reviews and grab your controversial copy of Just Stop Having Problems, Stupid, The Anti-Self-Help Guide!